Finish Line has recently become a Postural Restoration Center. What does this mean? That means that we are accredited by the Postural Restoration Institute (PRI for short). All of our physical therapists have had extensive training in PRI concepts. PRI helps us to recognize the human body’s natural asymmetries and how it affects neurological patterns in breathing, walking and activity. The human body is asymmetrical, you say? A big take home of PRI is that the human body is asymmetrical. You have two arms and two legs, however all other systems of the body are naturally asymmetrical by design (for example your internal organs). Muscularly, our right hemi- diaphragm sits with a slightly higher dome than the left, and the attachment tendons of the diaphragm are asymmetrical in thickness. Now, you can’t necessarily see any of these internal asymmetries, but they can present themselves externally. The difference in diaphragm strength and weight of internal viscera right vs left can cause rotation in the pelvis and trunk, as well as a tendency for lateralization to one side. This can present as having increased muscle mass on one leg compared to the other, uneven shoulder or rib height, differences in hip rotation motion, or spinal curvatures. Why is this important during treatment? We will get to that a little later. When walking around Finish Line, you’re sure to see a few patients blowing up balloons. Why? PRI has helped us understand the importance of proper breathing mechanics and its role in everyday function. Breathing is pretty important.. You do it about 20 thousand times per day! Your postural patterns can have a pretty strong effect on the way in which you breathe and vise versa. 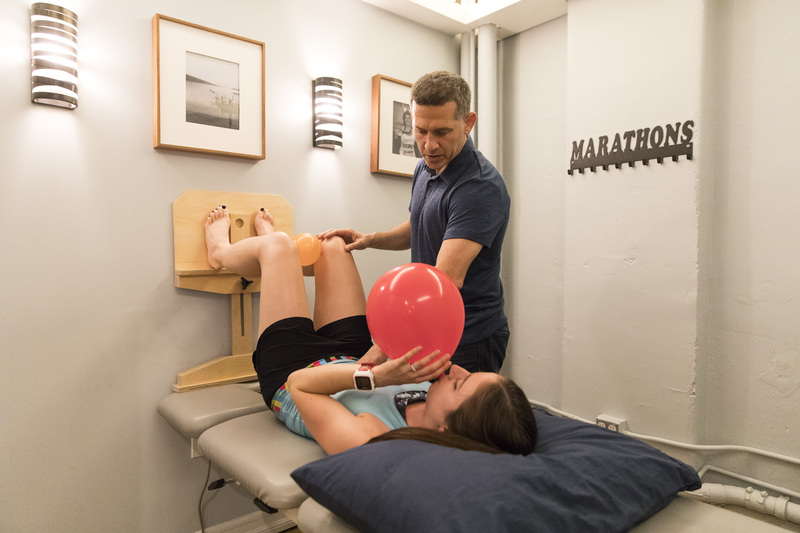 Our therapists want to ensure proper position of respiratory muscles to help their function. This can alter muscular patterns throughout the body. Especially with our runners, how you breathe during running can have a great impact on what muscles you tend to use more/ less. Our therapists understand the importance of correcting any dysfunction in breathing patterns to give our patients the best care possible. Your body is one big system! The Postural Restoration Institute also helps us understand how all systems of the body work together for function. Muscularly, it helps us understand “polyarticular chains”. Put simply, these are muscular “chains” that tend to work together for posture and function. There are several polyarticular chains in your body working together at all times to control your upper and lower body as well as your trunk. When treating muscular dysfunction, it is important to examine not only the dysfunctional area, but system as a whole. Afterall, not one muscle or joint works in concert during normal physical activity. PRI has helped Finish Line Physical Therapists treat injury and dysfunction with an increased knowledge of how the human body functions. We attempt to find the cause of dysfunction and not just treat the symptom. We acknowledge the human body’s natural asymmetries and postural tendencies giving us amazing tools to treat our patients.